Features : There is full radiator central heating on the boat. Hot and cold running water supplied from a 250 gallon water tank. Double filtered drinking water system. Berths : As this is a 6 berth boat, there is a choice of a double berth or two singles in both the forward and rear cabins. All permanent beds have interior sprung mattresses. 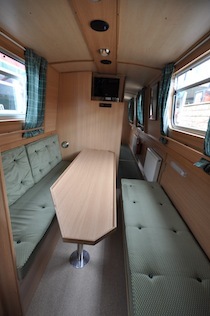 An optional dinette/double or two single berths is available in the centre cabin/saloon. TV in each cabin. Bathroom : Two bathrooms, both with a wash basin, flush toilet, shower with bi-fold door. There is also a 240v shaver socket. Extractor fan. Additional Information: Front deck table. Instruction and buoyancy aids supplied free of charge.